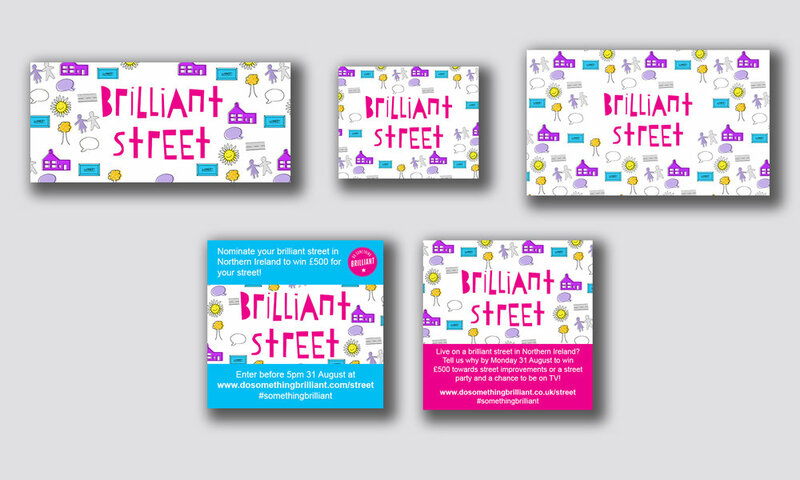 A promotional graphic was to be created for the "Brilliant Street" campaign which was happening in Northern Ireland. There was a competition to find the country's best street, who would win £500 towards street improvements and TV publicity. A core design had to be generated which in turn would be used across social media and email. Original 'Do Something Brilliant' graphics. "Brilliant Street" and body copy. Having to be wary of colours which can't be used in Northern Irish graphics (as to avoid any political conflicts). Final Artwork produced for Brilliant Street. Colours such as dark blue, red, green and orange have been avoided. Artwork has been tailored for various channels including Instagram, Twitter, Facebook, and email.